Minnesota’s Jay Cooke State Park is spectacular in any season, but it really shines when the leaves begin to glow with fall color. This story begins in the depths of winter, in February, to be precise, when we made a quick stop at Jay Cooke State Park on our way up to the North Shore. We’d never been to Jay Cooke before, but I knew the park had a suspension foot bridge across the Saint Louis River, so we headed there for a good overview of the area. One look and we knew we had to return in fall . . . the upturned rock in the riverbed would be interesting in any season when not covered with snow, but the mixed hardwood and pine forest above it would make a wonderful frame for the river when ablaze with color. So last week we were back. 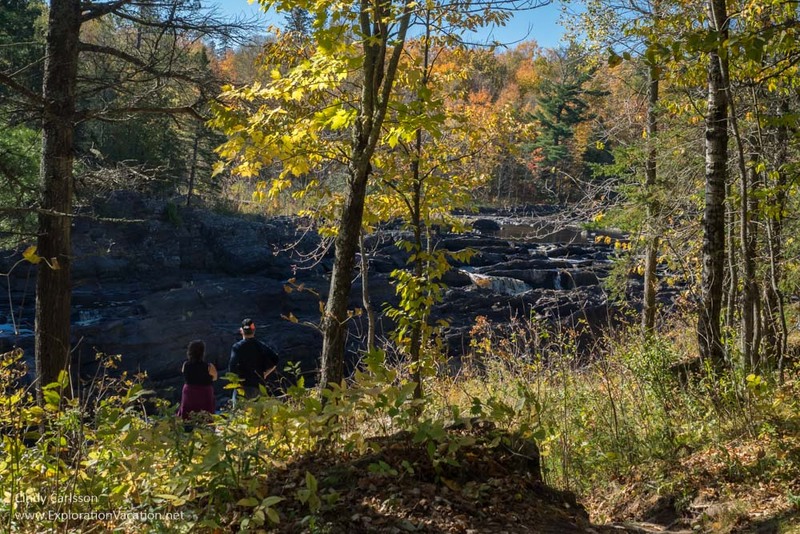 And, yes, fall is a wonderful time to visit Jay Cooke State Park. While we thought the odd rock formations here would be fascinating any time, I really hadn’t realized that the whole river bed would be filled with waterfalls when not frozen! There are also a couple of easy-to-reach overlooks that feature broad vistas. While there was plenty of fall color right along the highway, the trees along the hiking trails were also showing off their seasonal wardrobe. It’s the perfect fall get-away. 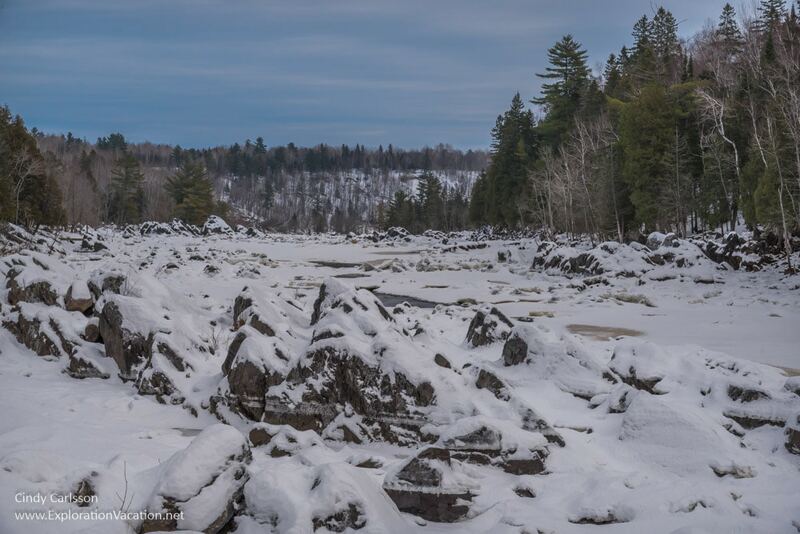 Minnesota’s Jay Cooke State Park is truly an all-season park. Besides fall foliage, visitors can enjoy a variety of winter sports, spring wildflowers, and a cool summer respite along the water or in the woods. Jay Cooke State Park is located just south of Duluth, in Carlton, Minnesota. It’s about 2 ½ hours north of Minneapolis and Saint Paul by car. It’s also possible to bike to the park using the Willard Munger State Trail, although that will take considerably longer. Hinckley makes a good starting point for a bicycle tour. Within the park, roads allow easy access to most of the signature features. However, the main road through the park (Minnesota Highway 210) washed out during a flood in 2012. Reconstruction of the road is underway, but it’s not scheduled for completion until October 2017. Until that time, the park is split into two sections, making access to some areas a bit cumbersome. 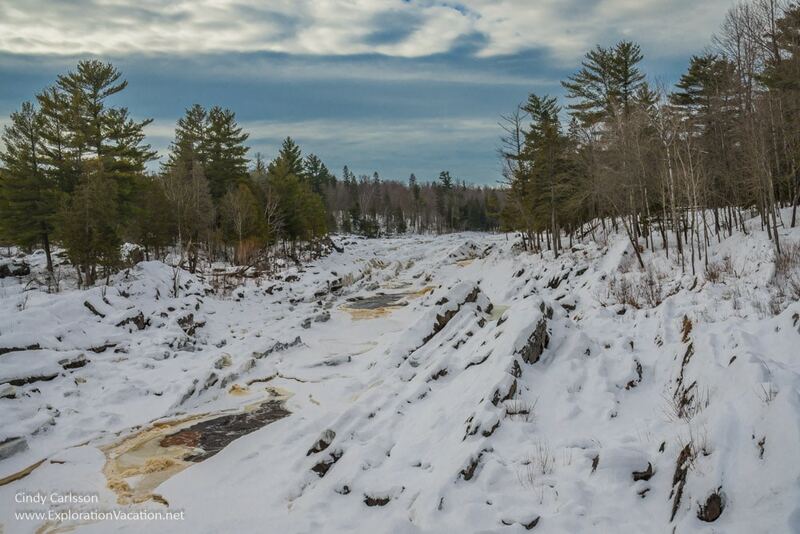 The Saint Louis River winds through the heart of Jay Cooke State Park. Along the way, it tumbles over jagged rocks that create a steady stream of cascades and small waterfalls. It’s a dramatic and unusual landscape. And fall at Jay Cooke is absolutely gorgeous. Various overlooks provide great views of the river, but the most popular is the view from the park’s iconic swinging bridge. Right now 45 miles of trails are open for various uses. That seems to indicate that a number of the trails are closed, but it still leaves plenty of room for exploring away from the crowds you’ll find at the bridge. In winter, there are about 30 miles of cross-country ski trails. There are also 7 miles of snowshoe trails. Just down the road from the main section of the park, the Upper River Gorge near Thomson Dam has a series of trails with spectacular views of the Saint Louis River. 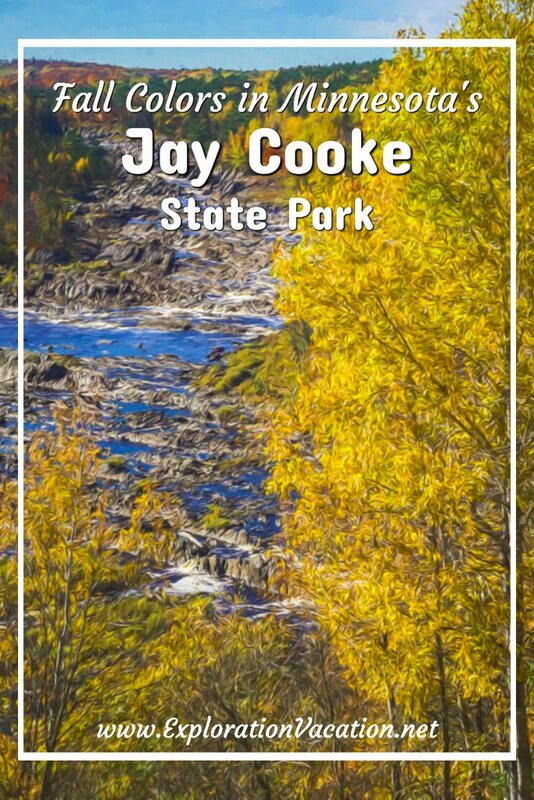 Jay Cooke State Park also has a number of historic sites, including the Pioneer Cemetery, the Grand Portage Trail (used by early fur traders), and the River Inn and other historic buildings constructed by the Civilian Conservation Corps. The Swinging Bridge is a recreation of the historic bridge. Like all Minnesota State Parks, a permit (available at the park) is required for all motor vehicles entering the park. Fees are also required for camping and other park lodging, but must be reserved in advance. The park visitor center has a gift shop. Ice and firewood are available and, during the winter, visitors can rent snowshoes. Jay Cooke State Park has about 80 campsites, some of which are open through the winter. The park also has five camper cabins. All lodging in the park must be reserved in advance through the Department of Natural Resources reservation website. Note that you’ll have to plan well in advance if you want to stay in one of the camper cabins. The nearest lodging outside the park can be found in the small city of Carlton. There are only a couple of choices and on busy weekends they may be fully booked. However, there are many more options as you head north into Duluth. Carlton also has a couple of restaurants. Or you can pack a picnic and eat at the park. Of course, there are also plenty of restaurants available in Duluth or to the south in Cloquet. 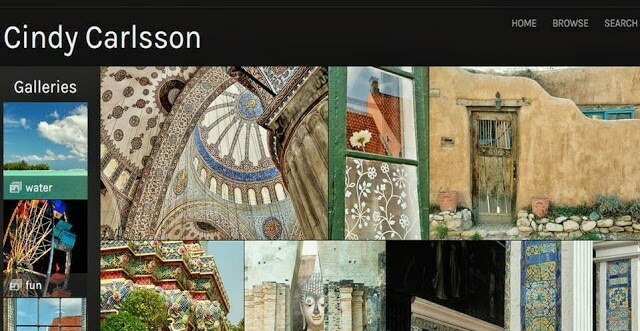 Again, TripAdvisor is a good resource for finding the best restaurant for you. Thanks for this, Cindy. Beautiful as usual. I just got done with a chapter in my current book, where the protagonist, N. H. Winchell, spends a week in this very area, the Dalles of the St. Louis, sampling and examining. The basalt, of course, is part of the Duluth Complex, the molten rock that came up from the Midcontinental Rift. Thank you, Sue. We were just blown away by all that exposed, sideways rock. It’s such a cool place geologically. I’ll be very interested in reading about Winchell’s visit – are we talking about the end of the 19th century? I’m planning to do a post on the Thomson cemetery (how often do you get a graveyard along with your hiking trails! ), so am hoping I can find some good info on it and a few of the people buried there. Most of the remaining grave markers seem to be 1880s/1890s. Jay Cooke State Park looks so pretty! I bet it’s just as pretty in the spring, with wildflowers and all… It always amazed me in the US how the state parks rival the national parks in beauty, and have much smaller crowds. Yes, Rachel, I think spring would be good. I’m guessing there are native orchids there. But fall is just so dramatic!